Wanting to come to the City of Lights all the way from US, but do not know how to find the right airlines to fly to Paris? Of course you would need to take a flight when coming from overseas, but how to find the cheapest airplanes from the US? There are a lot of search engine tools you can use to compare prices, in order to find the most beneficial transportation, i.e Tripadvisor, Momondo, and Skyscanner, just to mention a few. The popularity of the city has led to an increase in the number of cheap flights to Paris. The airline flights to Paris from the US are available daily, on all leading airlines. There are various rates on airfare to Paris, which are a big hit right now with travelers. You will most likely land in Paris Charles De Gaulle Airport from the US in Paris, which some says are as good at the city itself! The Charles De Gaulle Airport is actually the largest airport, and ranks among the world’s main centers for aviation. After Heathrow, this Parisian Airport ranks second in Europe in terms of business. It spreads over a large area with three world-class terminals. 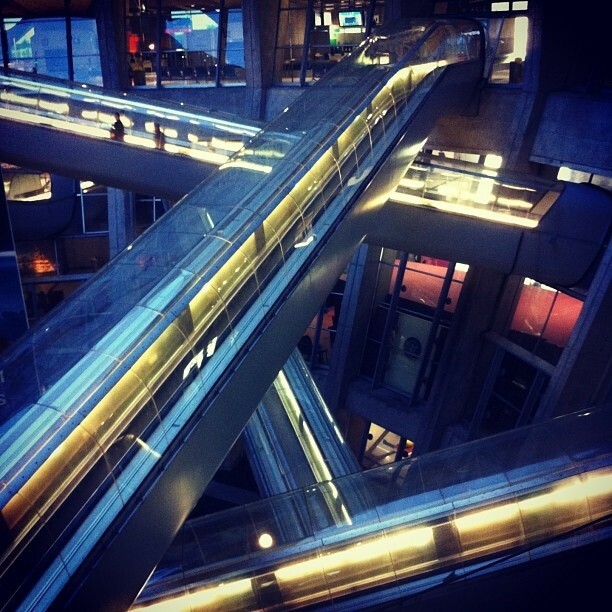 With buildings, atriums, shopping stops within the airport complex, Charles De Gaulle Airport is indeed “A” grade. The ticketing and boarding lounges are equipped with the best technology, and the airport is indeed an exhibition of true Parisian spirit: fast with a distinct charm. The cheap flights to Paris from the US, are drawing more visitors to the French capital, so the airport receives a large number of flights to Paris daily. The rates on most Paris flights are very reasonable, and specials deals and discounts on airfare to Paris are a nice bonus. 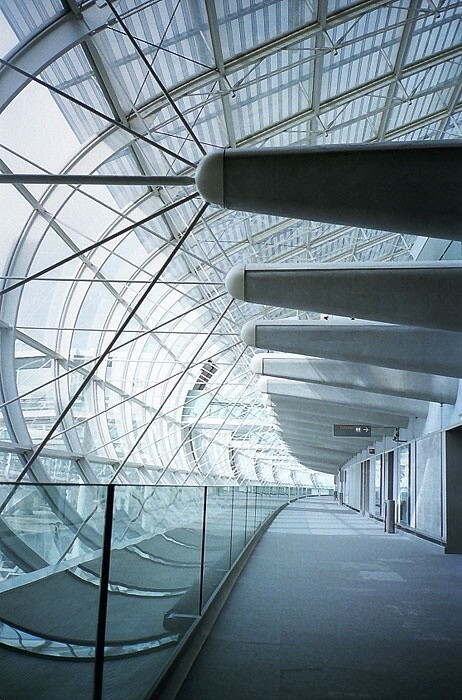 Charles de Gaulle… Beautiful architecture! You need not worry about commuting to any part of Paris after landing at the airport. The airport is connected to the city and all of Europe by the high-speed rail network. There is also the option of the RER railway suburban service, operating along specific stations in Paris. So, with other words… No excuses for not going overseas to visit the City of Lights, because Paris is always a good idea, right? Montmarte is definitely worth the visit, if you have extra time. It is actually rising above Paris’ panorama, and Montmarte is different than anywhere else in Paris… It is a historic distric with history, character, and beautiful, and artsy streets with many hidden treasures. When you visit Montmartre in Paris, you will feel like being in a magical and imperfect village, far away from Paris. But when going to Montmartre in Paris on a visit, what to explore and discover? Montmarte is an artistic and bohemian village, which hosts some of the best known festivals in Paris during each year, and while being quite small regarding size, it has enough interesting sights for you to dedicate an entire day of your sightseeing in Paris to exploring the original, and timeless Montmartre. You do have to explore Montmartre’s artistic heritage, where the great artists lived. The drank their coffee in the cafes, played music and danced the night away. You get the sense when you are there; that Montmartre was and still is the artists’ community. To mention some former artists living in Montmartre, it is: Salvador Dalí, Max Jacob, Juan Gris, Pablo Picasso and Vincent Van Gogh. Seen that movie by Woody Allen “Midnight in Paris”? Well, Montmartre is where Gil Pender meets some of these world-known artists. When in Montmartre, you do not want to miss the vineyards in rue Saint Vincent. The vineyards in Montmartre presents a Parisian winemaking tradition, and and in the fall Montmartre hosts an autumn wine harvest festival that is truly a treat to attend if you’ll be in Paris in October! You also have to check out the adorable bakeries in Montmartre – and the cafes and bistros… So factor some time in your Montmartre sightseeing schedule to relax and have a glass of wine or a café – and be sure to try some of the cakes, pies and patisserie goodies of Montmartre. Of course, last but not least, you have to go to the very famous Basilica of the Sacré-Coeur, which is Paris’ highest point, and you can either hike up or take the tram, in order to go to the top and get an breathtaking view… You can also see the Eiffel Tower from here. Basilica of the Sacré-Coeur took about 40 years to build, and was completed in 1914. 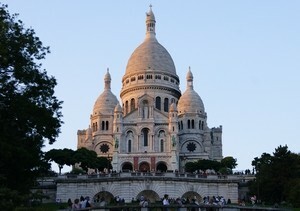 It is Montmartre’s biggest monument, so make sure not to miss. 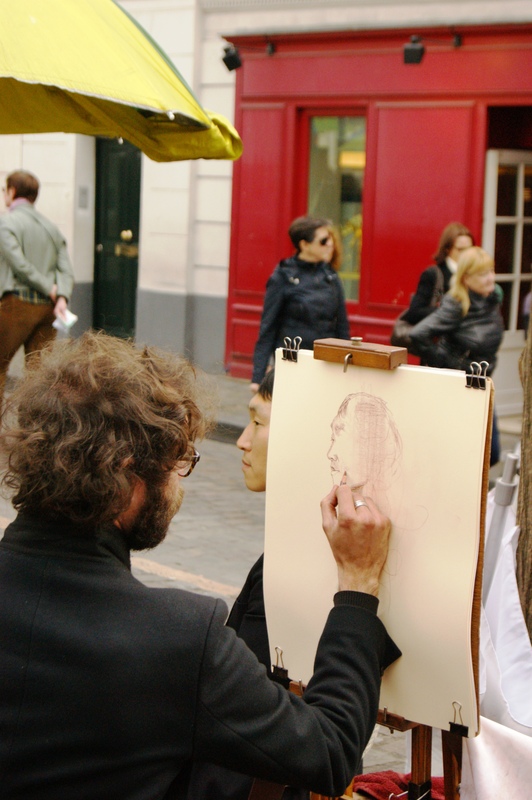 An artist is drawing the portray of a young man on the Place du Tertre in Montmartre in Paris. Remember that we on ParisByM have some packages, which includes a guided your in Montmartre with a possibility to try a wine tasting with high quality wines… Check it out!